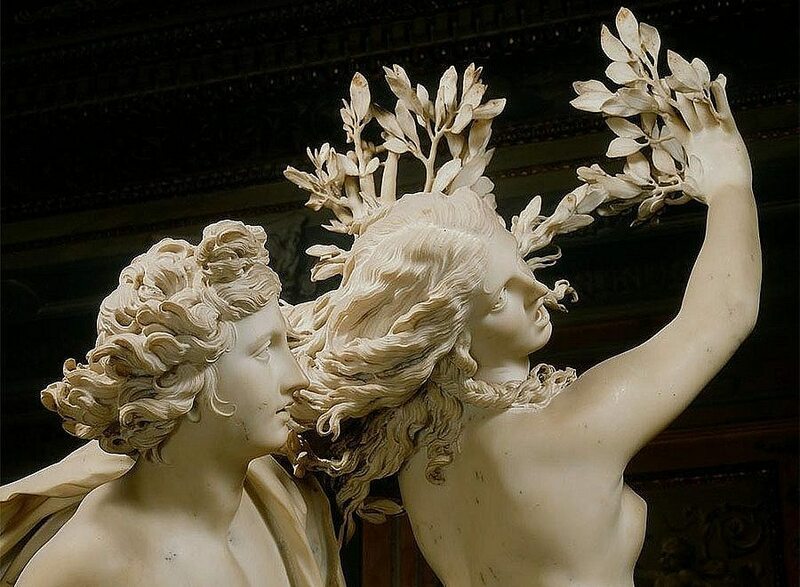 In this plaintive sculpture of Apollo and Daphne, Gian Lorenzo Bernini presents Apollo’s relentless pursuit of Daphne as she begins her transformation into a laurel tree. Bernini, a prominent 17th Century Italian sculptor and architect, was famous for developing the Baroque style of sculpture. In this sculpture, Bernini interprets the myth of Apollo and Daphne. Daphne desires to live a life of chastity; yet, Apollo, who after being struck by cupid’s arrow, infringes upon Daphne’s goal with his infatuation. As a result of Apollo’s advances, Daphne pleads to her father for help, and he turns her into a laurel tree. Despite Daphne’s elevated height in the sculpture, Apollo’s gender and bodily position gives him an advantage. Through his close proximity to Daphne, he invades her personal space and disregards her rights as a woman. Bernini captures the acute realism of an unwanted sexual advance through the positioning of Apollo and Daphne. Although the detailed ripples within Daphne’s hair evoke beauty and the sensation of hair blowing freely in the wind, Daphne’s open-mouthed facial expression reminds the viewer the state of terror she is in. Her neck which is sharply craned to the side communicates instability. In the life-size sculpture, Daphne appears to be falling. While, Apollo’s blank hypnotized visage contrasts with Daphne’s panic. Apollo’s lack of affect speaks to his opportunistic approach. Daphne’s rights and wishes appear irrelevant to him. Furthermore, the full-size render depicts Apollo with a possessive hand wrapped around Daphne’s waist. It is nearly impossible for Daphne to evade danger. Even as she approaches “safety,” she loses ownership of her body. Thus, it may be suggested that Apollo prospers from the chase of Daphne. Her hands which sprout rounded laurel leaves and branches form the shape of a wreath-almost as a crown to be used by Apollo. The myth concludes with Apollo using the leaves and branches of Daphne’s tree to create his crown. By turning into a tree, Daphne gains some control of her fate; this decision enables Daphne to preserve the integrity of her goal to live a life of chastity. Daphne’s choice shows that it is sometimes necessary to give up a part of oneself in order to preserve the essence of one’s identity until the opportunity to be whole with another presents itself. many greek mysteries are interesting and can evoke many emotions. Besides keeping dignity and criticizing Apollo’s ignorance of a female’s wishes and will, it seems as life is full of unexpectedness as well. Apollo was driven under the effect of Cubid’s arrow. what if he was never hit by the arrow and everything probably would have been different.